StencilQuik™ BGA rework stencils make it easy for you to place BGAs. Whether the site is being reworked, you are simply wanting to place a part on a prototype board or the mask damaged underneath the part needs to be repaired, StencilQuik™ is the method to use for BGA placement. For rework applications the need for a high end split vision rework system is eliminated. The balls tactily can be felt fitting in to the apertures of the stencil. A simple time temperature heat source will now reflow the solder balls on the bottom of the device. This simplicity is carried over to the prototyping area as complex packages such as BGAs and CSPs can be easily placed without the need for or training in high end equipment. Finally, the StencilQuik™ BGA rework stencils have a side benefit of being able to repair solder mask underneath the location as the polymide is an elegant “band aid” for the repair of the damaged mask. Customized versions are shipped in 5 days after check plot approval. ORDER. Whether you are using paste flux or solder paste the StencilQuik™ BGA rework stencil process speeds up area array rework while providing for a more reliable connection. This method features a unique stay-in-place feature which simplifies the placement while increasing the yield of reworked BGA's. One of the numerous ways it increases the BGA rework yield process is by widening the process window through the use of greater solder paste volume which is assured of being in each one of the apertures. The method is even part of the industry's PCB rework and repair guidelines- the IPC 7711 Procedure 5.7.2. These flexible BGA rework stencils remain in place on the site location becoming an integral part of the PCB assembly. StencilQuik™ BGA rework stencils are manufactured from a polymide film with a high temperature adhesive covered with a release liner. It is the same type of material you have been using with bar code labels and for protecting gold fingers during the wave soldering process. These stencils are laser cut from high quality, anti-static polymide film with a residue-free high temperature adhesive backing. The StencilQuik™ BGA rework stencil apertures correspond to the land patterns on the PCB and define those portions of the PCB which are to have paste or paste flux applied. StencilQuik™ BGA rework stencils are available in 4, 6 and 8 mil total thickness and are packaged in groups of (10) in a small anti-static poly bag. We will compare the product pattern you are requesting to our extensive library of many hundreds of patterns. If we already have the pattern in our library then we will send it to you for approval. If we do not already have the pattern (there are many thousands of BGA ball patterns!) then we will quickly design the preform and send you a .jpeg file for approval. There are no tooling charges. 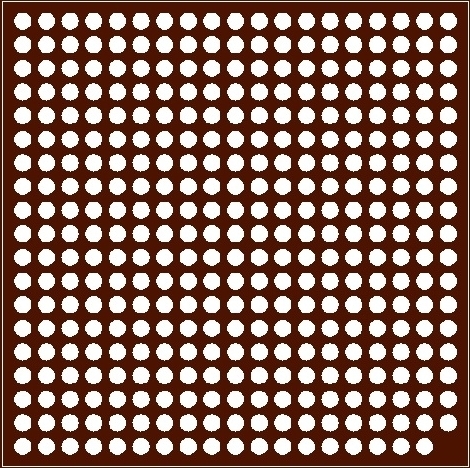 New or complex patterns are designed from the part datasheet and will be confirmed in many cases with a checkplot. Squeegees are sold separately. They are shipped in 5 business days after check plot approval. Fast turn options are usually available for you to get your pattern in a day or two. There are no minimum order sizes and no tooling charges for StencilQuik(TM). Check out the independent testing that has been done on this product to verify these results. An independent lab has tested the StencilQuik(TM) BGA rework stencil product (See panel "B") to make sure that there is no ionic contaminates left behind by any of the adhesive residues. We invite calls with application questions about StencilQuik(TM) or if you have further questions!